Meijer of Grand Rapids, Mich., is recalling about 22,200 Wave Zone zip swimsuits. The company has received 11 reports of the snaps detaching. No injuries have been reported. This recall involves the Wave Zone one-piece, zip-back swimsuit for newborns, infants and toddlers. 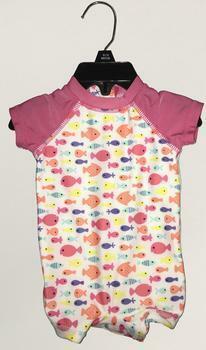 The swimsuits have a zipper on the back and four snaps on the bottom and were sold in four colors: blue and gray with a shark on the front; white and navy stripes with an anchor pattern; pink and teal with a strawberry on the front; pink arms with a multi-colored fish pattern. The swimsuits, manufactured in China, were sold exclusively at Meijer stores in Illinois, Indiana, Kentucky, Michigan, Ohio and Wisconsin from January 2017, through July 2017, for about $14. Consumers may contact Meijer at 800-927-8699 anytime or online at www.meijer.com and click on “Product Recalls” at the bottom of the page for more information.